​Editor’s note: This is part of our summer series, The MMQB 100, counting down the most influential people for the 2015 season. When Captain Edward Smith retired to his cabin on the Titanic just after 9 p.m. on the night of April 14th, 1912, he could rest easy knowing that he was in charge of the largest, most opulent and technologically advanced vessel the world had ever seen. Under his stewardship were the heirs of great fortunes, titans of industry and celebrities. But also the cooks, porters, servants, waiters, musicians, émigrés, second and third-class passengers, one stowaway, deckhands and the countless others who made the ship go. The Captain gave little pause as a forbidding cold front blew across the Atlantic, even though the thermometer had dropped some thirty degrees from the previous day and his radioman reported icebergs directly in his path. His belly was fortified by gilded age cuisine such as turtle soup, lobster thermidor, consommé Olga, along with the finest wines and distilled spirits available; a dinner party had just been thrown in his honor by some of the ship’s wealthiest passengers. He had become beloved by the finer circles of society and given the affectionate nickname, The Millionaires’ Captain. He believed nothing could sink his ship and saw no reason whatsoever to interrupt the party. The engines’ fires were kept stoked and hummed along, full speed ahead. There was a schedule to keep and time, of course, was money. Maybe out of prudence, or perhaps for the sake of appearance, he altered course slightly south and west to half-heed the warning from his crew. Still, he went to sleep a confident man. A little more than two hours later, his unsinkable ship struck an iceberg that condemned two-thirds of his manifest into the abyss of the Atlantic. Questions endure to this day: with so much evident danger, what did he know, when did he know it, and why didn’t he do more? If Edward Smith was known as The Millionaires’ Captain, then Roger Goodell is The Billionaires’ Captain. He is at the helm of the most profitable sports league on the planet. Its revenue surpasses that of 56 countries. His goal is to reach $25 billion per year by 2027, which would place the NFL on par with the country of Estonia in terms of raw revenue. It is an astounding value to be affixed to any single entity, let alone a game. And it speaks not only to the wild popularity and success of the NFL, but also to the ambition of the 32 franchise owners and the man who manages the game itself. No. 31: Odell Beckham Jr.
My concern as one of the lesser employees on his ship—actually, who am I kidding, I’m the stowaway—is that he is either ignorant to or deceiving all of us about the of problems that lays in his course, not unlike a field of icebergs. The biggest iceberg I can see is brain trauma. This is a tough game and no one who has suited up in pads and played under the bright lights would tell you otherwise. A dangerous subtext of toughing out injuries remains prevalent, accepted as part of the game’s moral fiber. We admire those who fight through injuries that would seemingly cripple a weaker being, but not all injuries can be seen with the eye. This kind of pain is driving some of our beloved heroes to despair, some even to the point of shooting themselves in the heart so they can preserve their brains as a record of the game’s destructive forces. As fans, can we still be as passionate about play when play starts to become as real as life and death? And if, to paraphrase what the late Junior Seau once said, what we are watching is the players’ sacrifice of later life for the glory of now, then what are we to believe when the league’s captain keeps telling us how safe the game really is? Young players such as Chris Borland, Jake Locker and Anthony Davis walked away from the game while still in their primes, citing long-term health concerns as the reason. No less than Mike Ditka has said about football, “I think the risk is worse than the reward. I really do.” A chorus of voices from within the NFL is saying the game is too dangerous. What does it say about a commissioner who doesn’t seem to be taking those voices seriously? That he doesn’t care? Or that it’s not convenient for the league’s elite class of owners and executives to deal with the truth? Has Goodell become another captain ignoring the safety reports from his crew? In fairness, the commissioner has somewhat acknowledged the issue. But only halfway and, like a team that knows its offense is doomed, he keeps punting the issue. But public perception can only be managed so much. Participation in Pop Warner football has been on the decline since 2008. There are numerous studies showing the extremely harmful effects of subconcussive hits on a young brain. CTE has even been found in high school players. Fifty percent of parents now say the game is too dangerous for their children to play. If this trend continues, if mothers think it too risky for their sons, tomorrow’s Aaron Rodgers and Russell Wilson will be playing other sports. I fear that the NFL’s unquenchable quest for growth will come at the expense of those who aren’t the owners. The Ray Rice saga crystalized this. In his handling of domestic abuse, Roger Goodell has shown himself to be a poor and reactive captain, adjusting Rice’s suspension only after a furious public backlash to the video footage. The suspensions of Greg Hardy and Adrian Peterson also came out of this furor. Roger Goodell has always said that his primary focus is to “protect the shield.” If he means the integrity of the game, he has failed. He has used the shield to protect himself and the vested interests of the league. This leaves me feeling conflicted. I want to root for the fortunes of my team, not the fortunes of my team’s owner. Nor do I want to root for a game that destroys the lives of those who play it. I really do believe in the inherent goodness of this game. But without an objective and unsparing search into the very soul of it, it will only grow uglier. I fear that the NFL’s unquenchable quest for growth will come at the expense of those who aren’t the owners. So far nothing has sunk this league, but icebergs are tricky: Nine-tenths of their mass lay hidden beneath the surface. What I mean is, some blip on the sonar may seem insignificant for now, but if Roger Goodell keeps stoking the engines toward trouble, his ship will go down. I assume the owners will escape comfortably in their lifeboats. But something of the players who have given their bodies to this game and the fans who have given their hearts to it will be lost to the abyss. If he proves too reckless, Goodell will be expected to go down with the ship. This isn’t to say that the NFL is doomed, but I at least want a captain who admits that danger exists. Anything else seems like an all too familiar arrogance. Is it possible to boo someone with a smile on your face? I didn’t think so, until I had the chance to attend this year’s NFL draft. When Roger Goodell took the stage to announce the first pick, the auditorium erupted in boos. I joined in, but found myself grinning at the same time, happy to be in the same room with the commissioner. My relationship with Goodell is complicated. I reached out to him in the wake of Deflategate, both as a mom and as a fan. I’ve walked away from watching interviews and press conferences shaking my head, wondering what he could possibly be thinking. And yet, I admire him a great deal. It calls to mind the relationship I had with my dad during my teenage years. I loved to hate him, but deep down I was grateful for what he did: set limits and make the big decisions for me. I respected him for doing a difficult job, but the last thing I wanted was for my friends to catch wind of the fact that I kind of liked the guy. Do I think Goodell handles everything well and always makes the same decisions I would make? No. Can he be aloof, abrasive and a little out of touch? Yes. Do I feel that, above all, he has the best interest of the NFL at heart? I do. What I’d like to see from Goodell in the future is consistency across the league in upholding the integrity of the game, both on and off the field. I’d like to see him take what he learned from a difficult season and use it as an opportunity to make the league better. I’d like to see him delegate more, hopefully by giving women and minorities more responsibility in league operations. I mean, what mom wouldn’t make a mean discipline czar? I’d implore him to continue his support of USA Football and to do everything in his power to make the game safer for players. Do those things and I’ll continue to support him in his role—just don’t expect me to stop booing him in front of my friends. I think South Park got it right when it comes to Roger Goodell. They called him the “Goodell-Bot” who said platitudes to keep money flowing for owners and keep the heat off them. You never get the sense that Goodell has any self-doubt on his direction at all, even when confronted with things that would concern most people. Ironically, by grandstanding on integrity and criminal justice issues, Goodell has put more of a spotlight on the negatives of the league. How does it support “integrity of the game” when there is perpetual uncertainty with punishments and a lack of trust in investigations? For that matter, how can Goodell promote safer, better football for players when he promotes Thursday night football and the disruptions that go with international travel for games? A lot of fans think Goodell is a lawyer. He isn’t. It seems like his worldview is constrained by only working for the NFL straight out of college, starting as an intern and working his way up until he was finally promoted to the level that shows his incompetence. The worst manager is someone who doesn’t know what he doesn’t know but has immense power. The kind of power where people may not be candid with him, and his subordinates let pizza grow cold while waiting for their boss to eat the first slice. I have no confidence in Roger Goodell’s ability to restore fan confidence in NFL processes. I don’t think the NFL cares. What is good for fans or players or the game is subordinate to what makes the owners money and enhances the power of the commissioner. “Process” matters to leagues because what the NFL can do to one team or one player, it can do to any team or player if the process is flawed. I don’t feel comfortable gloating when a team I don’t like gets busted in this way, because next time it could be my favorite team getting nailed based on really sketchy information. Personally, I like sports commissioners when I rarely hear or see them other than at the draft. 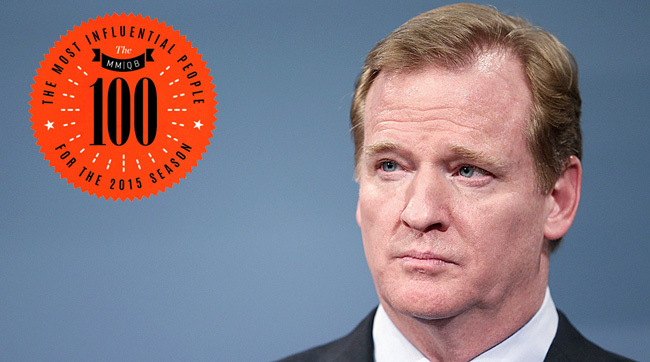 Is Roger Goodell Really Worth So Much Money? Some think Roger Goodell has a nice comfortable job given the NFL’s prosperity. In January, it was reported that he had made about $300 million over the previous seven years as commissioner. Remember, he works for the team owners, who dictate his salary and grade his performance. They obviously think he’s doing a great job, because he’s lining their pockets with some serious dough. But with the recent scandals, reports of growing anger amongst players, and the close relationship he has with Robert Kraft, is Goodell really worth so much money? Goodell isn’t afraid to introduce and try new things, whether it’s protecting the players on the field, reducing the contact they can have at practices during the season, or moving games out of the United States to promote the brand. Despite his good intentions, however, Goddell has come under scrutiny. The booing he received at the NFL draft would lead you to believe that people are ready for a new commissioner. In the court of public opinion, Goodell should have been fired years ago. Despite being on a mission to “protect the shield,” Goodell has taken shots based on how he handled recent major controversies under his watch. The NFL has made some major headlines for the wrong reasons, such as Spygate, the 2011 lockout, Bountygate, the 2012 referee lockout, brain damage, the Ray Rice domestic violence incident, the Adrian Peterson child abuse charges and Deflategate, just to name a few. Yes, the NFL is the most popular sport in the United Sates and has a massive following worldwide. Would the NFL continue to have this level of success with a new commissioner at the helm? We might not know for quite some time. As long as Goodell increases the NFL’s popularity, continues to line the pockets of the team owners, he will remain the guy in charge despite the negative opinions of players and fans. When I asked fellow Packers fans on Twitter for their thoughts on Roger Goodell, I heard a multitude of responses. The revenue growth the NFL has experienced under Goodell’s leadership was brought up, as well as the rising cost to view (for out-of-market fans) and attend NFL games. Even the growth in the salary cap was brought up a few times. The NFL salary cap has grown over 40% since Roger Goodell took office in 2006, and according to reports, that number will likely climb even higher when the new TV deals are announced in coming years. Packers fans also brought up a few other reasons why they disapprove of Roger Goodell’s tenure as commissioner. The Super Bowl XLV ticket fiasco still sticks in the craw of many Green Bay fans. Hours before kickoff in Arlington, Texas, over 1,800 fans found out their seats weren’t ready for the game. They spent hard-earned dollars to watch the Packers take on the Steelers, but couldn’t sit in them because their seats were deemed unsafe (according to reports, all but 400 were relocated in the stadium). The referee lockout of 2012 is another negative mark in the eyes of Packer fans against Roger Goodell. The Week 3 Monday night game between the Packers and Seahawks is still a very sore subject in Green Bay. That game, of course, was decided by replacement referees on a blown touchdown call that should have been ruled an interception that would have ended the game, not a touchdown that won it for the Seahawks. Packers fans (and most NFL fans) reserve their harshest criticism for Goodell’s handling of the Ray Rice and Greg Hardy incidents. The general consensus is that the punishments were woefully inadequate in light of the heinous actions. Many fans think the recent announcement that Hardy’s suspension is being reduced from 10 games to four falls on the office of the commissioner, even though arbitrator Harold Henderson ultimately made that ruling. Fans look at the punishment that some players receive for marijuana use and wonder why it’s more stringent than what some players have received for assaulting women and children. They scratch their heads and wonder, How does this even make sense?